The truth is there. You just have to see it. 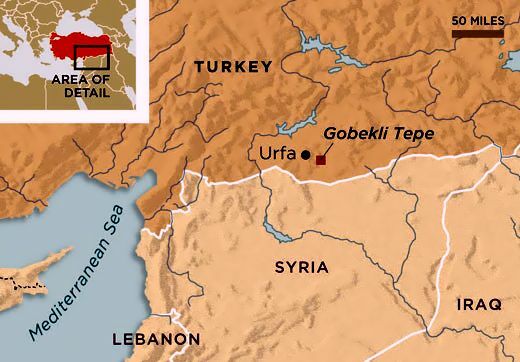 In 1995, nine miles northeast of the town of Şanlıurfa (formerly Urfa / Edessa) in southeastern Turkey, just north of Syria, a Kurdish shepherd noticed a stone sticking out of one of his fields, located on a hill called Gobekli Tepe. Charmingly enough, the name means “Potbelly Hill” in the local language. The shepherd was aware that many lucrative ancient artifacts were being found throughout the region, so he began to dig around the stone. He dug and he dug and he dug. 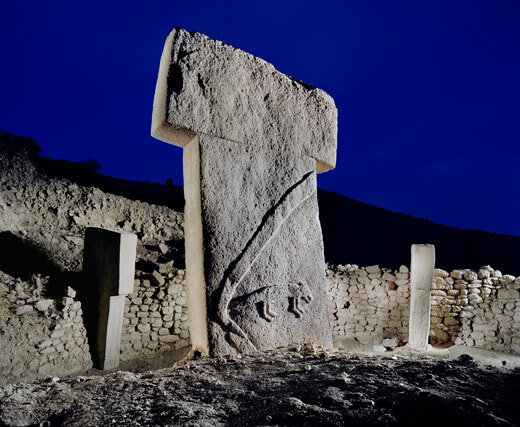 When he finally had the dirt cleared away from the stone, he had revealed a 19 foot tall pillar –expertly crafted and carved with strange images of extinct animals and birds, bizarre humanoid images and other designs as yet undeciphered. 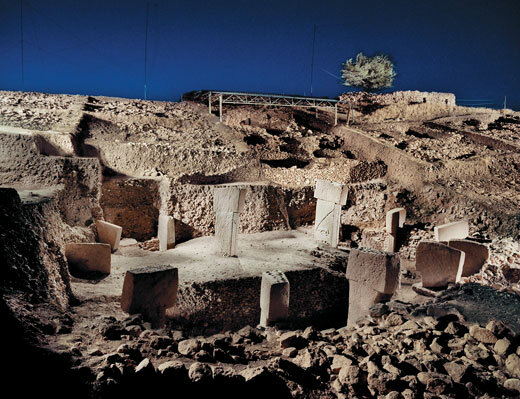 A German archaeological team has been working at the site for 19 years. In that time, they have excavated only about a thousand square feet, perhaps 10% (if that) of what they think lies beneath the surface. I don’t really give a lot of credence to the accuracy of their dating techniques, but the comparative results are stunning. This may be the oldest man-made construction in the world! And it is huge! Monolithic pillars linked by coarsely built walls form circular or oval structures. 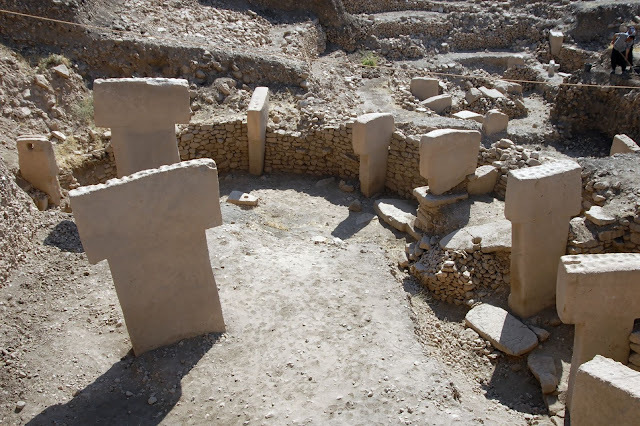 In the center of each structure there are always two taller, T-shaped pillars, which are set in very shallow sockets carved out of the bedrock. 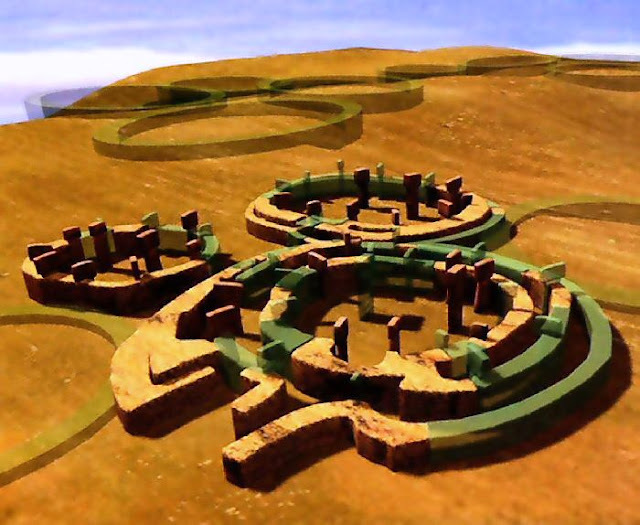 These 19 foot tall stones would have never stood upright by themselves, indicating that there must have been some sort of supporting roof structure. 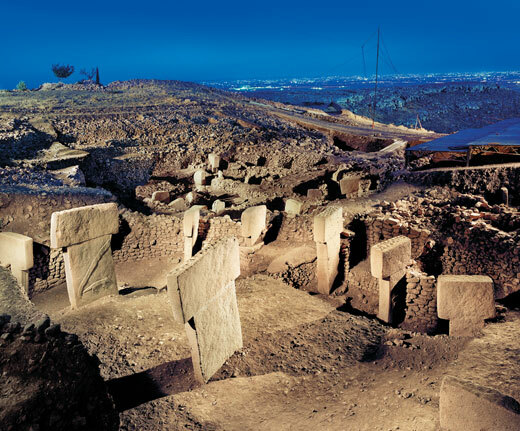 Artist's rendition of what archaeologists think might lie beneath the sand at Gobekli Tepe. So far, four such buildings, with diameters between 10 and 30 meters have been uncovered. Geophysical surveys indicate the existence of 16-50 total structures. Around all of this expertly carved stonework, not one stone working, cleaning or even agricultural tool has been found. In addition, the evidence indicates that this huge complex was deliberately buried. 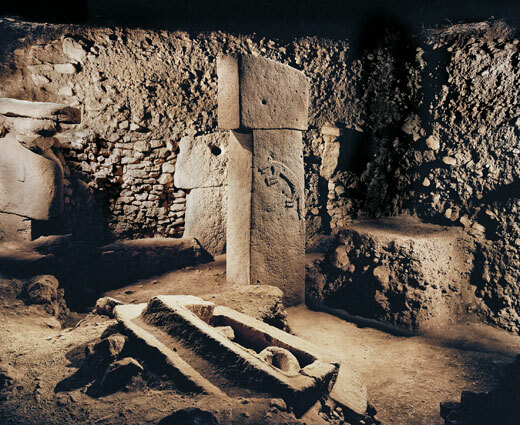 What is relevant for our discussion, is that the dating shows the oldest structures are the ones that are most advanced, most skillfully made. There is no indication of a progression, an evolution, from simpler, more primitive designs to the more complex and more skillfully made. Quite the contrary, there is a devolution. This is disconcerting and embarrassing for the politically correct archaeologists. It is in no way surprising to those of us who are not bound by the narrative of the evolutionary proponents. Civilizations, cities and temple complexes all over the world, including the valley temples of Gaza, Egypt, the ancient cities of Sumer in Mesopotamia, ancient cities and structures in China and the great Indus River Valley cities all show the same thing. Peoples suddenly showing up in the archaeological record with complex skills (tool-making, math, medicine, science, architecture and construction, city planning, astronomy), fully developed and complex,with no sign that there was a development of those skills. There are no evidences of earlier, simpler attempts at these skills. The ancient peoples just have seemed to have them, at levels that still sometimes exceed our own, from the beginning. This blog has been written with the sole purpose of using the ample evidence available to verify and support the biblical record, while refuting the copious propaganda that is shoved down our throats daily by materialistic uniformitarians. It is my contention that the Bible describes God's original creation of people with extraordinary capabilities who subsequently built an advanced civilization that exceeds our own. That civilization was destroyed in the Great Flood and we have spent the last 5,000 years trying to re-build that civilization. I contend that science supports all this in multiple disciplines, but this information is ignored or suppressed by various people who have an opposing agenda. Nothing that you see on this blog is original. Any fact that you see here is obtainable on a dozen different websites and books. I use these facts and photos, without violating their copyrights, under the legal principle of fair use practice. That is, I use them one time, for educational purposes only. The point is, nothing here is made up. The only thing that I do (or need to do) is assemble this information in a discernible pattern. You might want to read through the first entry posted on this blog (Past Remembering: Thoughts toward a coherent view of our ancient past, our present and our future) in order to understand my theoretical and theological underpinnings more clearly. And that which has been done is that which will be done. 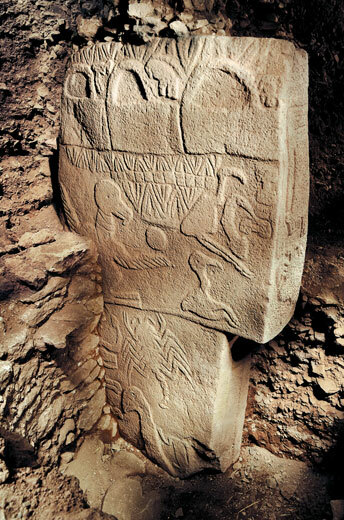 What happened to Hattusas and the Hittites? The Antikythera device: 2,000 year old clockwork?